Aren’t there some things that take you straight back to the pure innocence of your childhood? Shucking corn is one of them for me. My family owns a small, non-winterized cottage in Westport, Massachusetts. Each summer growing up we visited to expect a few weeks full of trapping blue crab, fishing, building sand castles, putting on shows at the community center, whale watching, and eating lobster dripping with butter. Fresh corn would accompany nearly each meal. We would pick it up from the farmer at the end of the road…then shuck it right before plopping it into a huge pot of boiling water. It was the shucking job the kids used to get. We would sit on the step of the front porch and watch the neighbors pass by. One of my youngest cousins, Mina, was here for her annual visit from Boston last week. We had great fun together, and my kids adore her. She and I made a stop at the Zionsville Farmer’s Market where we selected some fresh corn. 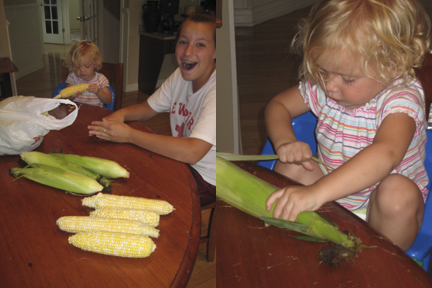 I told her she needed to teach the girls how to shuck corn. Campbell, in particular, loved the task. I loved listening to the two of them chat as they tore at the husks. And it brought me back to summers that smelled of salty air and seaweed. Four of the pictures in my office were taken in Westport, MA: Nathan shucking corn with his grandfather, Audrey shucking corn for me, my mother sitting on the front porch (my favorite picture of her), and Lee’s Wharf at Westport Point. We never have had better or fresher corn because Ted Rogers, the farmer, picks it just before he delivers it to us. Memorable moments in an idyllic place.